The Art of Collaboration celebrates over 40 years of artistic partnerships between Master Printer, Kip Gresham, and giants of the British and international art world, featuring work by 21 Royal Academicians. Women in Art: Hong Kong brings together the works of seven contemporary female artists covering the past 50 years of artistic development in Hong Kong. The works, which are in a variety of media from ink drawing to installation, all explore contemporary politics and the role of female artists within it. This timeframe encapsulates a period of monumental political and artistic change in Hong Kong and the rest of the world, complementing the works of international modern and contemporary art in the New Hall Art Collection. The works in Women in Art: Hong Kong are united by their simultaneous use of traditional techniques and contemporary themes and imagery. 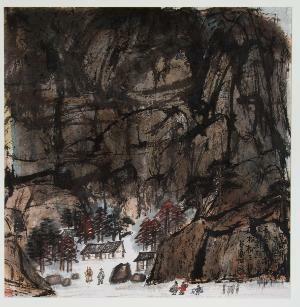 In her landscapes from the 1970s and 80s, the late Fang Zhaoling employs a classical calligraphic style to confront the pressing issue of human beings’ relationship with the environment. Jaffa Lam takes on the culturally loaded symbol of the spittoon in her kitsch ‘found sculpture’, which was inspired by a photograph of Margaret Thatcher and Deng Xiaoping discussing the handover of Hong Kong. Mediha Ting and Ko Sin Tung both capture the freneticism of contemporary urban life in their brightly-coloured multi-media works, which incorporate billboard imagery and computer speak. The works by Au Hoi Lam and Man Fung Yi recall American and European feminist works of the 1970s with their use of textiles, while also carrying strong political messages about contemporary Hong Kong. ‘Drowned Books’, a newly-created work by Yan Chi Choi also confronts the recent history of the region, featuring a stack of books submerged in vegetable oil, which simultaneously preserves and destroys them. Opening on International Women’s Day, the exhibition is shown alongside research by New Hall Art Collection and the Asia Art Archive which focuses on the status and representation of women artists working in Hong Kong over the last five decades. Hong Kong’s colonial past, geographical location and political history make it a fascinating case study for the emergence of female artists. Through a series of group conversations with artists of different generations, the project tracked the shifting experiences of female artists: from the baby-boomers born in the 1940s and 50s who were forced to study art abroad, to through to those born in the mid-1980s who were liberated by an increasingly globalised art scene, but curtailed by the repressive actions of the government. This exhibition is co-curated by the New Hall Art Collection team (Professor Martin Roland, Sarah Greaves, Naomi Polonsky and Harriet Loffler) and Eliza Gluckman, Senior Curator at the Government Art Collection.